I just posted alpha 5 of handyLock. The application is getting much better. Still lot of work but it is working pretty good for me. – Much better implementation of screen sleep. Screen saver still not implemented. Will work on this next. Should be easier now that screen sleep is implemented. Was not easy to figure out. – Partial fix for sleeping monitor not working when handyLock is locking the screen. Need more work but partially resolved. – Fix for logic as to when the screen will be unlocked. It was unlocking too fast before. Now it will only unlock when you are in the “near” range and will only lock when you are in the “far” range. Still need heavy signal tuning algorithms but the basic stuff is getting better. – Fix for flawed logic in when to lock/unlock screen. 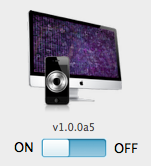 – Fix for ON/OFF switch not having effect.